Are there any female angel names? Does the Bible mention female angels? What about other traditions? The Bible does not specifically mention any female angel names. In fact, no female angels are mentioned anywhere in the Bible. Then I raised my eyes and looked, and there were two women, coming with the wind in their wings; for they had wings like the wings of a stork, and they lifted up the basket between earth and heaven. So I said to the angel who talked with me, "Where are they carrying the basket?" And he said to me, "To build a house for it in the land of Shinar; when it is ready, the basket will be set there on its base." But are these women female angels? Some experts believe that these two women are fallen angels. They say that because these women carried "wickedness" in the basket they could not have been heavenly beings. Holy angels, these experts argue, would never carry any evil with them. Needless to say, this conclusion has raised a bit of controversy among certain circles. Modern metaphysical teachers say that angels and humans have a divine complement (the same concept of soulmates). Michael, who is depicted as a male angel, has a divine feminine counterpart, they say. Interestingly, in his book Angels, Malcolm Godwin presents the argument that the Archangel Gabriel was actually female. Everyday people who claim they have personally encountered angels say that they have seen female angels. Winged women have also appeared in ancient cultures. Nike, the Greek goddess of Victory, is depicted as a woman sporting two wings in her back. You could say that she looks like an angel. In Arabic tradition, female angels are not rare. In fact, they were the recipients of reverence and veneration. As you can see, there are many theories as to the existence of female angels. But whether you believe in female angels or not, you will enjoy the following female angel names. Some of these angelic names are not really names of angels but stem from the word angel. These female angel names come from different sources: Ancient traditions, Judaism, Christianity, Zoroastrianism, and literature, among others. Anaita - In Zoroastrianism, she is one of the highest ranking angels. She is the "immaculate one, genius of fertilizing water and of the fruitfulness of the earth." (from Gods, A Dictionary of the Deities of all Lands, Redfield). Aruru - She is a female messenger of the gods in Sumerian mythology. Ardouisur - In Zoroastrian belief, this is the name of a female cherub. She is also the angel of fertility and childbirth. This female angel also helps lactating mothers to increase their milk output. An alternate name is Ardousius. Armaita - She is the spirit of goodness, truth and wisdom. In Persian mythology she’s one of the 6 or 7 archangels (amesha spentas). Other versions of this name are Aramaiti, Armaiti. Astarte - Not exactly an angel, she is the Ancient Phoenician moon goddess of fertility. Barbelo - In Gnostic tradition, she is portrayed as a supreme female principle. In popular angel lore, she is also the angel of goodness and integrity. Bath Kol (also Bat Kol, Bat Qol) - In Hebrew this word means "small voice or whisper". It is also defined as "the daughter of the voice". Bath Kol is not an angel name per se but it is a divine concept. It signifies "Divine Voice" in rabbinic lore. 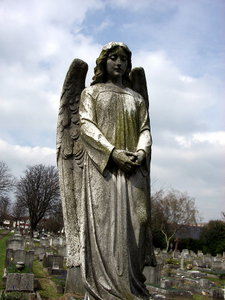 In popular angel lore, Bath Kol is the angel of prophecy. Benad Hasche - Meaning "the daughters of gods", they are female angels in Arabic tradition. Charmeine - In popular angel lore, she is the angel or harmony. Corinne - A fictional female angel in Jonathan Daniels' Clash of Angels. Derdekea - She is a divine female spirit who came to earth to save mankind. In Gnostic lore, she is known as the Supreme Mother (source: Paraphrase of Shem). Dina - In popular angel lore, she is the angel of learning. In cabalistic lore, she is the guardian of the Torah. Drop - In the Gnostic Berlin Codex, she is described as a female divine power who descends to Earth for the salvation of humankind. See Derdekea also. Eloa - The angel of sorrow and compassion. She is said to have been born from a tear Jesus shed. In Alfred de Vigny’s poem Eloa, we find Jesus at Lazarus grave. He is deeply moved by the grief of Martha and Mary after losing their brother. So he sheds one heavenly tear, and Eloa is born. Epinoia - According to Gnostic tradition, she was the first female manifestation of God. Isda - The angel of nourishment according to The Dictionary of Angels… by Davidson. Some describe her as being a female angel. Isis - An Ancient Egyptian goddess, she is often depicted as having wings. Nefta - In Flemish lore, she is a female angel with whom the angel Azrael (the angel of death) fell in love. Paula - A fictional female angel in Jonathan Daniels' Clash of Angels. Sophia - In Gnostic belief, Sophia is the chief female manifestation of wisdom. Seket - According to the cabala, she is a female angel who abides in Egypt. Shekina, Shekinah - In Gnosticism, she is a female aspect of God. Gabriela - Spanish feminine form of Gabriel, the name of one of the archangels. This is a popular "female angel name" in Spanish-speaking countries. Gabrielle - Feminine version of the name Gabriel. Mary - The Virgin Mary is referred to as "Queen of the Angels" in the Catholic faith. See Regina also. Michaela - Feminine form of Michael, the best known of the archangels. Regina - The Catholic Church bestowed the honorific title of Queens of the Angels to the Virgin Mary. Her official Latin title is Regina Angelorum (Queen of the Angels). See Mary also. Serafina, Seraphina - Feminine version of Seraph meaning "the burning one". The Seraphim are one of the nine orders of angels according to Christian tradition. I hope you enjoyed this list of female angel names. Did you find a special female angel name? For more names of angels, please check the following. You may also visit the pages listed below.